Firstly, congratulations on the grand embarrassment accorded to all of us PF members… Sponsored by our leadership and it’s collective greed, arrogance and detachment from the people. Many excuses have been brought forward… It was a UPND + NDC win and not an NDC win. I say they beat PF + MMD and not PF alone. Luanshya is a peculiar case because of the lack of jobs and general hardship being experienced by the people… I say show me a town that is any different right now because from where I stand, the lack of jobs and the general life hardships is a nationwide problem. We where beaten because the people rejected us and what we took to the table.. I say they rejected us rightly so… It is immoral to substitute leadership with gimmicks for purposes of winning election… Our leadership has turned to tricks as way of winning elections… Saudi goats, mulungushi textiles, maize marketing and recent black mountain giveaways are but some of the examples. Obtaining the mandate to preside over the affairs of a nation is a rare honor and privilege which must be taken seriously and the responsibilities therewith understood. The welfare and development of a nations people is non negotiable and must never be viewed as a favor to the people.. Public leadership is a duty that must be accepted, respected and executed with true diligence without question. 1. The narrative of lies being told to the President has outlived its usefulness… His Excellency ECL is the most powerful man in our land and the buck stops with him. He always has a choice and always makes a choice and like I said about gimmicks, he is fully aware of everything because in 2016 he assembled officials at Mika Hotel and paraded his aides with a promise to part ways after the election because he understood how the structures felt.. Gimmick! 2. Our leadership has steadily grown in greed, hate, gluttony and dishonesty… The sheer number of senior officials involved in the suppression of citizen’s opportunities to thrive just so they themselves can usurp those opportunities is dangerously high and frighteningly unsustainable. 3. The callousness and derelict attitude with which we as a party are governing is ridiculous and unworthy of the mandate given to us… We cannot have line ministries contracting sovereign debts when they have no income generation capacity and say we know what we are doing economically… We cannot have Valden Findlay in every picture, on every flight with the President when Valden Findlay was not elected by the people and has not been appointed by the President.. This is an abuse by the Presidency because his benefiting from public resources has shot through the reasonable ceiling and what is worse is that he often has other family members with him on the Presidential Jet… Whether true or false, what is spoken of Mr. Findlay by the ordinary Zambian renders his association with the head of state scandalous at best.. and yet the Presidency even had him standing behind Prince Harry in official photographs… I say let us show a lot more seriousness and respect to the hardworking citizens of this country who make it possible for the Presidency to enjoy the extensive luxuries that seem to have become the purpose of being in office. 4. The President must show true leadership and save the party from ruin.. It is he who has the authority and ultimately it is he who is responsible for the long suffering and infringed upon youths of our Party the Patriotic Front…. One cannot allow the rubbish being perpetrated by the SG in these intraparty elections and expect to have a strong party… The selective justice in PF by the SG and the National Chairman Mr. Samuel Mukupa cannot be said to be good for the party… It is this rubbish that is responsible for the position we find ourselves in as a party… The leaders we have do not have the party or the people of Zambia at heart, they care only about themselves and how much money they can make before the boat sinks. 5. This is a question to the President… How did you think the people would perceive you and the office you hold when you allowed a minister to be going to court charged with corruption and still hold office? I say… It is time to introspect and as a leadership, beginning with the President, choose to put the people before yourselves because contrary to what you are practising, leadership is about unity and not polarization, about service not favors and about serving and moving on and not gaining and destroying the vessel. The General Membership of the Patriotic Front has walked in shame because of some of the decisions by our leadership and this grossly unfair because as leaders it your duty to lead correctly. The roan loss was good because it has finally burst the bubble of lies.. and shines a spotlight on the foolishness of the Party spending K40 million on a By-Election and losing when it would have cost less to just provide the correct leadership… It is time to check ourselves and our arrogance as a party because blaming others for our failures will not work.. When serving, success or failure determines which box the voters tick.. It has long been time to think but we have chosen to be thick in the head and think we can buy the vote at every turn.. So think about the loss and make deliberate choice to either keep destroying the Party or to Save and Grow the Party…. and please remember your words Mr. President.. *PF is not for Sale*.. Remember the common people who put us in power and pay for your luxuries… Life is hard out here and all things are dependent on your leadership… or lack thereof if you so choose..
Dear Chileya G. Chilekwa, well spoken and well analysed. PF started off under Sata as a well meaning, proper party – but now has changed into a corrupt gang of thieves. And – sorry to say – Lungu is the gangmaster, the biggest thief of all. Contrary to Sata, he does not think about ordinary people – just about himself and his cronies. Wake up, dear Chileya G. Chilekwa, before it is too late. 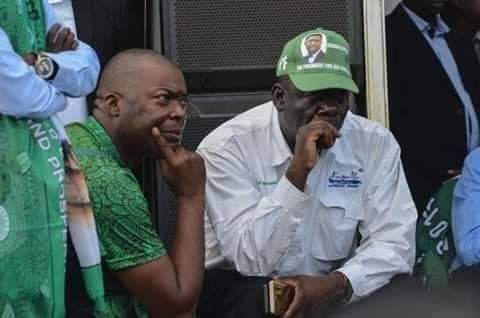 Abandon PF and support any other party (I won’t name names, you have to make your own choice) and drop Lungu along the wayside. Zambia can still be sved! I did not know that PF still have analytical people like the writer of this article. All we here is trash from Lungu, Kaizer, Kampyongo et al. I wonder how a level headed person like the writer is fitting in with criminals? To get the true mindset of the PF machinery one need only look at the majority of the top leadership and its cadres. They came in as paupers with the sole purpose to reap where they did not sow. To plunder national resources. These are seasoned window shoppers always looking in from the outside. We let them in. Consequently,their belief system is and still remains ‘money can buy anything, everything and everyone’.. all the time. The Roan loss should have debunked this mindset but somehow I doubt it. When you have a group of illiterate and arrogant people in high numbers such as PF under one umbrella nothing good comes out of it. They become toxic. This is PF’s Archilles heel and undoing. PF is a group of mercenaries hell bent on taking at all costs. Sadly, I will have to conclude the Head of State is driving this vehicle until he proves otherwise. The Government must pay Zampost,UNZA,CUB, Trades Training Institutes, Councils, etc their understanding monies; otherwise they not going anywhere! It was Sesheke then Luanshya, next it will be the whole country waking up! Forget about the wins in rural constituencies such as Kasenengwa, Bahati, those vote for names, they are not influenced by issues affecting national development,citizen welfare and economic well being of the country! This is time to reflect and listen to concerns of citizens! Oh Sesheke is not rural? I did not know and have always thought it was rural. To the unpaid employees, it was 40 million Zambian Kwacha spent. Do you hear? How many times does your salary goes into that? Do the maths, identify the culprit for your non salary payment…sort him/her out at an appropriate time.